Whoa, sorry guys, I totally forgot it's Wednesday. So here it is, real quick- Boom! Ok, as you can see, a lot of my tribals have moved out of the WIP area and will be coming to you soon for this week's DONE article. Woohoo! They have, however, gotten a little farther, and been joined by one or two new buddies, including the first of what will be many rad rats! 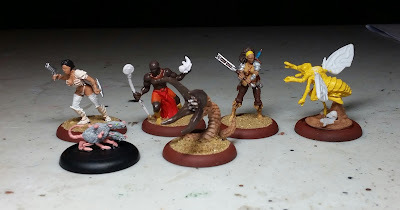 You know me and my rats- I volunteered to paint all of them. Not sure if that counts as painting models or terrain, but I can't wait to use them! And yes, that's an irradiated 6 foot wasp- yipe!